Are Solar Panels worth the investment - How much will you save? The standard solar company sales pitch promises savings of thousands of dollars on going solar. The solar salesmen make it sound easy, but while you make any smart long-term investment it pays to consider the details. There are a few major factors to consider before you buy into the hype. You should look at the facts to determine whether the answer to your question:” Are Solar Panels Worth the Investment?” is a Yes or a No. Your current electricity bill is the most important factor in determining how much you’ll save by going solar. You pay your utility company for electricity; they charge you for every kilowatt-hour (kWh) of electricity you use. Your electric rate depends on which state you live in and which utility provider you have in that state. In some states, you can pay as little as 8 cents per kWh; while in others, you’ll pay 30 cents or more. 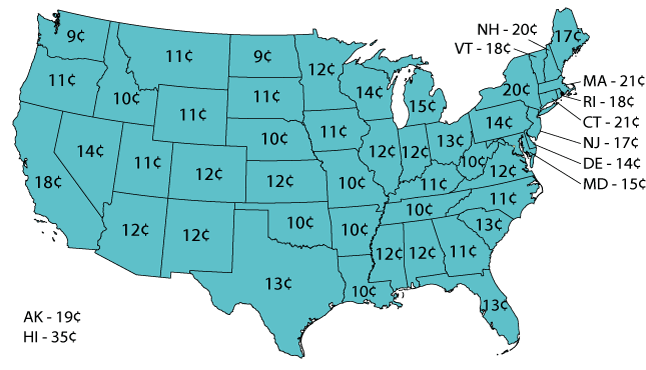 Here is a map showing average electric rates across the country. This shows average rates in the different states; your actual rate might differ. Therefore, the best way to find out how much you actually pay is by looking at your utility bill. Here is a detailed article which will help you understanding your electric bill. Once you know how much you are paying for your electricity, you can evaluate your solar options with confidence. 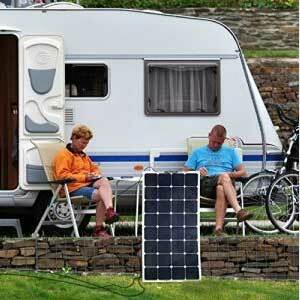 You can learn of the different varieties of solar programs in this article. 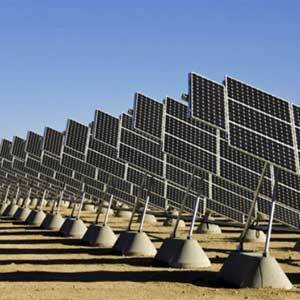 One of the most popular solar programs is the solar lease or solar PPA. 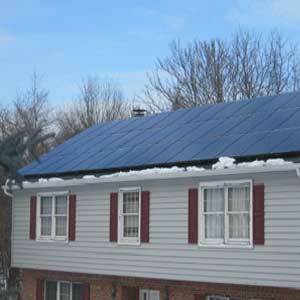 These programs effectively replace your utility company electric bills with solar electric bills. Once you go solar, your utility electric bills go down to almost zero and you pay the solar electric company for electricity at the new lower rate. For e.g. : if you are paying 18 cents per kWh for utility electricity and your solar company promises you 10 cents per kWh for solar electricity, the savings are immediate and easy to calculate. You save 8 cents for each kWh of usage. Lets look at the example on the left. Your electric utility charges 18 cents per kWh and your usage of 910 kWh per month results in an electric bill of $163 per month before solar. Post solar the electric bill from the utility company goes down to $5 per month. 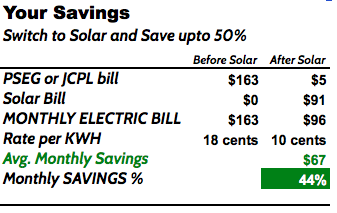 You have a new solar bill of $91 for the same energy (910 kWh @ 1o cents = $91); you save $67 per month or $807 in electric savings over the year. This article will also give you more information to evaluate more questions such as : Are Solar Panels Worth the Investment? 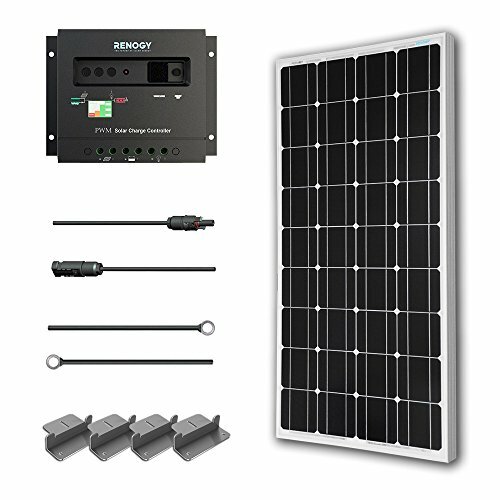 A solar system is effectively a mini electric power plant installed on your roof or in the yard. This mini power plant will produce electricity and replace your utility company as your primary source of electricity. 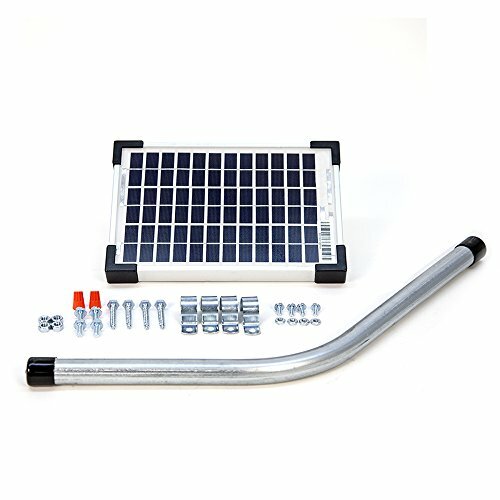 You don’t get disconnected from the utility i.e you don’t go off grid when you install a home solar system, you just stop drawing power from the grid. 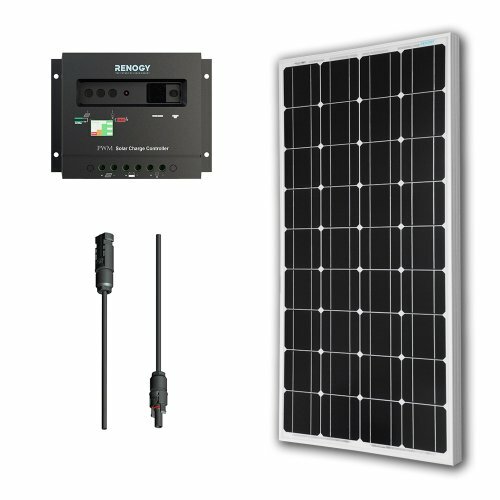 The grid acts as your backup to absorb any excess power your solar system produces or to provide power if there is a shortfall in production. As long as your solar system produces more power than your usage, you end up with a utility electric bill of $10 or less per month. As a homeowner you replace the high electricity rates from the utility and save by switching to solar electricity. 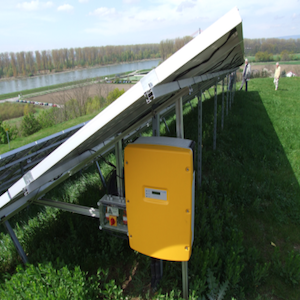 It is very important to know how much power your solar system will produce. 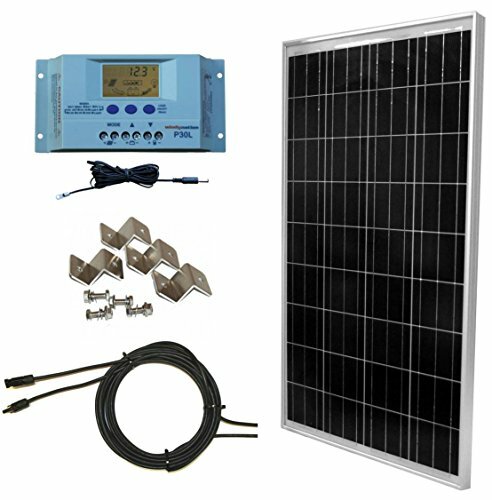 Here is a solar panel output calculator which will help you assess the amount of power your solar system will produce. The answer to the question ” are solar panels worth the investment?” is a YES if your answers to the following questions are all Yes. a. The difference between the rate for solar electricity and your utility is 4 cents or higher. The higher the difference, the higher the savings. If the difference is less than 4 cents your savings may not be enough to add up significantly over time. b. You have enough roof area or yard with direct access to sunlight for 6 or more hours every day. If you have trees which cast shadow on your roof for more than a couple of hours a day, your solar panels will not produce enough power. c. Will your solar system produce enough electricity to offset 75% or more of your annual electric usage. 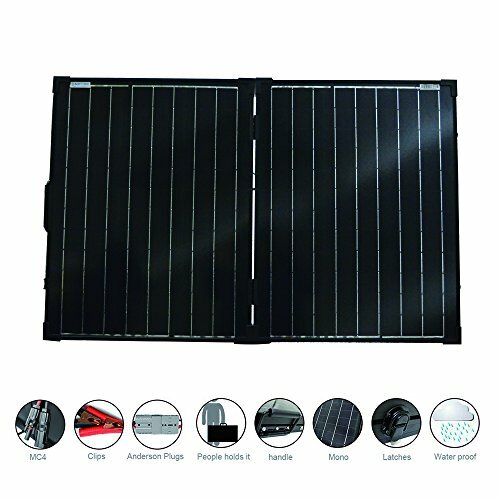 It your panels produce less than 75% of power, you are not likely to save enough to make your solar panels worth the investment. If you answered No to any of the above questions, it is highly likely that the answer to the question “Are Solar panels worth the investment?” is No for you. If you don’t like that answer, I would advise you to consult a solar professional before pulling the trigger on a solar system. You might end up not saving enough. There is a lot more you can do with solar. Check out the these articles . Thank you for visiting mysolarhome.us. 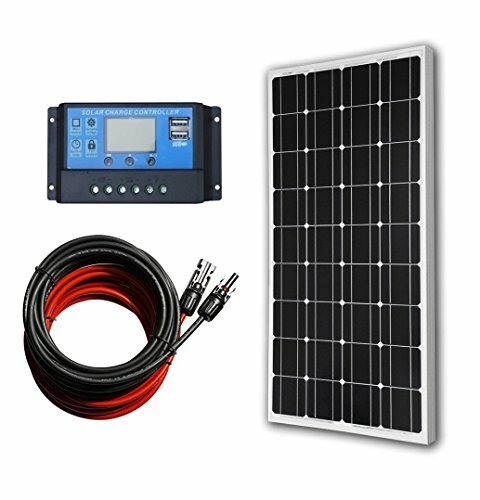 PWM Solar Charge Controller has user adjustable settings! 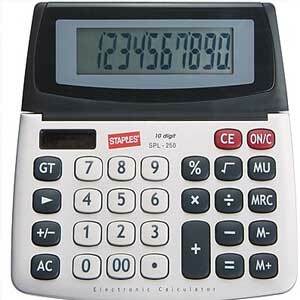 LCD Screen shows sytem amperage, voltage, amp-hours, temperature and DC load draw. See Image #8 in photo gallery for all LCD Screen readouts. 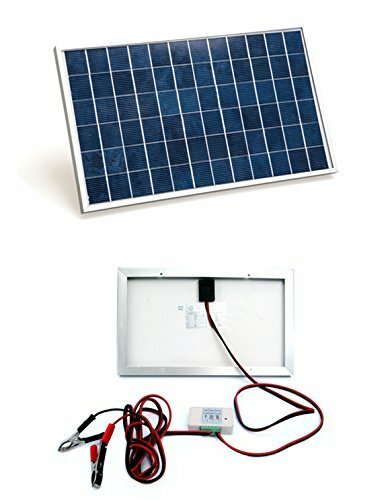 Kit will provide on average 820 Watt Hours (Wh) or 75 Amp hours of charge per day (depends on sunlight availability). 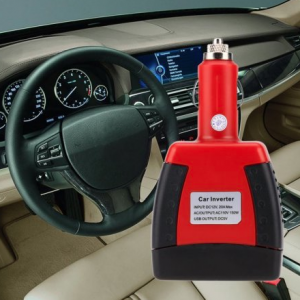 Can be wired for 12V or 24V battery charging. 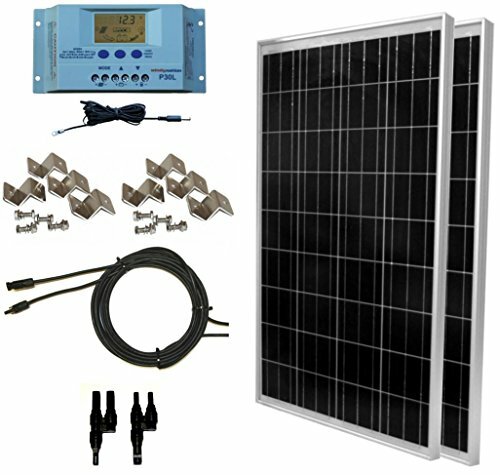 Complete kit includes: 2pcs 100 Watt WindyNation Solar Panels, 30-Amp (user adjustable) LCD Display P30L Solar Charge Controller with Battery Temperature Sensor, 40 feet of UL Listed 12 AWG Solar Cable, all necessary MC4 Connectors, all necessary mounting hardware and Installation Manual. Compatible with gel, sealed, lithium, and flooded batteries. Charge controller with LCD display for displaying operating information and data. For gates that lack a power source at the site of installation, rated for 8 - 26 cycles, see zone chart. High modules conversion efficiency. Ideal daily output: 500Wh (depending on the availability of sunlight). 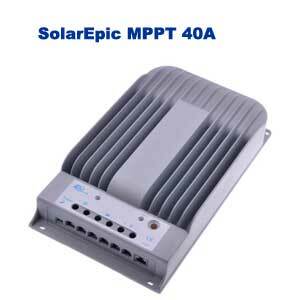 Comes with 20A PWM LCD display charge controller, you can expand your system up to a maximum of 400W. 5 meters red 4mm² extension solar cable with mc4 connector and 5 meters black 4mm² extension solar cable with mc4 connector for connecting solar panel to charge controller. 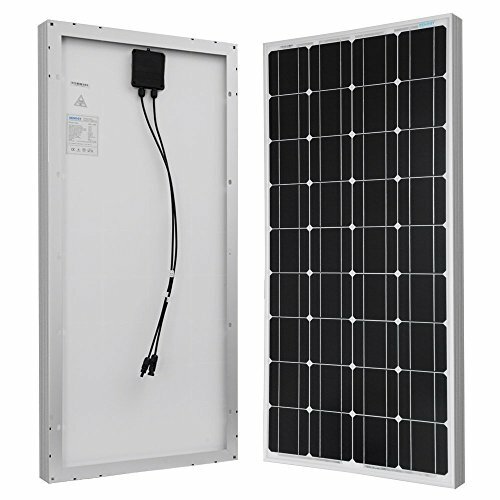 Corrosion-resistant aluminum frame for extended outdoor use, allowing the solar panel to last for decades as well as withstand high winds (2400Pa) and snow loads (5400Pa). Nice writing style and great information. 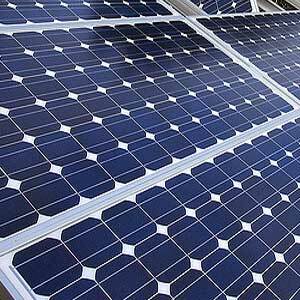 “Are Solar Panels worth the investment – How much will you save?” Awesome keep up the good work. 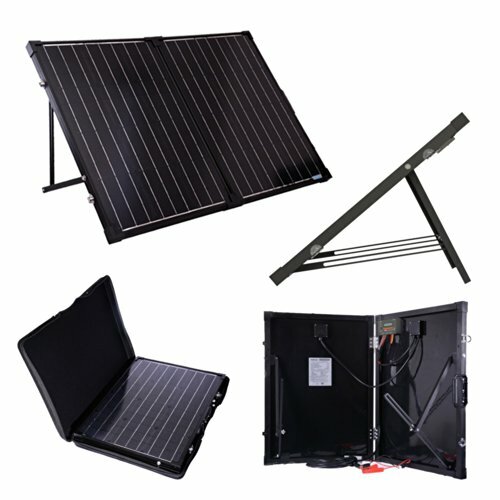 Your article really cut through the sales jargon and helped me determine that solar panels are actually worth the money, provided you know your needs. Thanks for the info.